Gabion is a welded wire cage or box filled with materials such as stone, concrete, sand, or soil. So, gabion is a partially flexible block construction used for slope stability and erosion protection in construction. Various types of gabions are constructed and used in different engineering constructions. Sometimes, live rooting branches may be placed between the rock-filled baskets which improves durability and stability of the gabion. This article presents gabion definition, types, applications, and advantages. 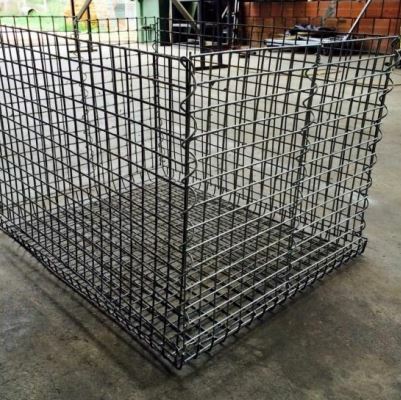 Wire mesh used to manufacture the cage of gabion shall poses certain properties otherwise it might not serve its purpose properly. 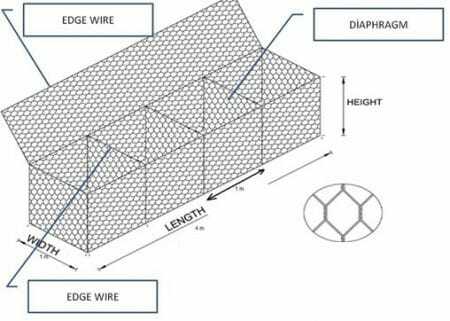 Table 1 provides the desired properties of gabion wire mesh. It is a net wire mesh that produced in box-shaped and in different sizes. Used in highway and railway works. It would be economical unless filling materials are not available from quarries near the project site. Gabion mattresses, also known as reno mattresses. Gabion mattresses height is shorter than the other types of measurements as it might be observed from the Fig. 3. It is employed in the channel coating for preventing erosion. So, it tackles wave and erosion induced velocity. Common size, 6 m long by 2 m wide by 0,3 m high. This type of gabions is formed quickly. It has a porous and flexible structure. Gabion sacks are usually used in hydraulic works in emergency conditions. 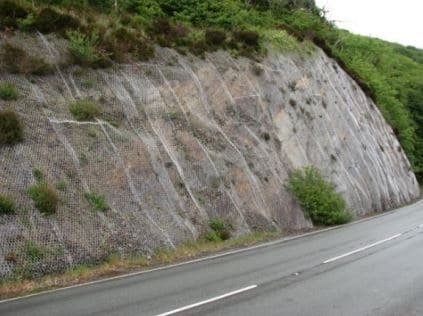 It is utilized to keep the possible rock and stone fall on the highway and railway surfaces. Gabion wire mesh maintains stability of the slope close to highway and railways. 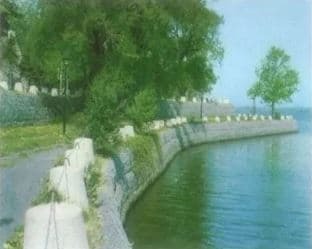 It is applied for anti-erosion to slope. It enhances embankment soil strength in combination with geogrid reinforcement. It is used indoor and outdoor decoration, garden design and landscaping. 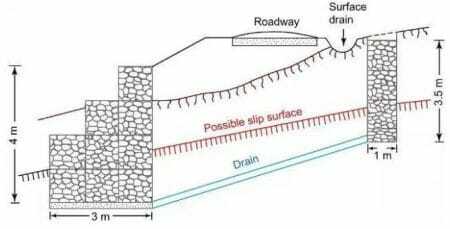 Retaining structures such as retaining walls (Fig. 7), revetment and toe walls to embankments and cuttings. Corrosion prevention structures for instance sea walls, river bank defenses, canal banks (Fig. 8), dams, weirs, groynes and for the protection of reservoirs and lakesides. 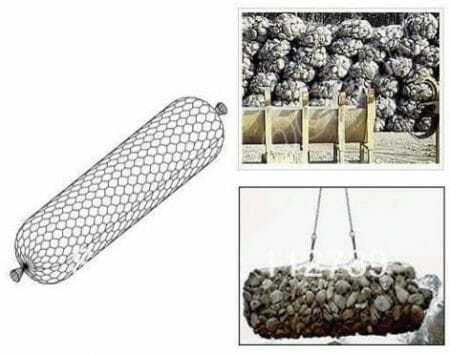 cylindrical metal gabion is used for dams or in foundation construction. It is employed as a noise barrier. Gabions are also used as a temporary flood walls. 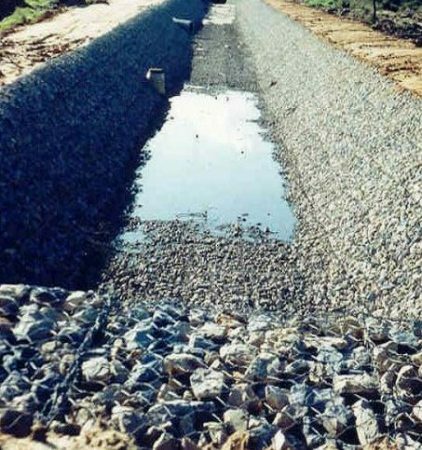 Stepped gabions improve energy dissipation in channels. Gabion has a very high resistance to atmospheric corrosion because of the well bonded zinc coating on the wire and their ability to support vegetation growth. This feature permits the gabion to settle and deform without failure and loss of efficiency. Specifically, when unstable ground and moving water are encountered. It provides automatic and easy drainage which eliminates the need for the installation of drainage pipes. Gabions are satisfactory strong that is it is capable of resisting flood force, torrential force, and ice and earth pressure. It is more economical in terms of both material and labor in comparison with other gabion alternatives. Recycled materials can be placed into the gabion cage. The gaps in the soil between filling materials allow the plantation to grow over time. 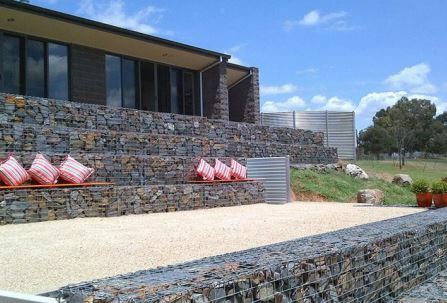 Gabion elements are not affected by natural phenomena.